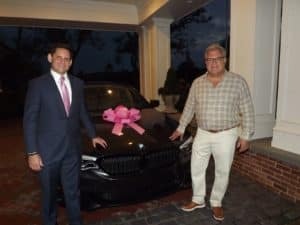 EATONTOWN, N.J. (October 11, 2018) – Circle BMW, the region’s premier BMW dealership, today announced their commitment to support women’s breast cancer care at Hackensack Meridian Health Jersey Shore University Medical Center. During October, National Breast Cancer Awareness Month, Circle BMW will donate $100 for every car sold, to the Perricone Center for Women’s Cancer located within the Cancer Center at the medical center’s new HOPE “Healing OutPatient Experience” Tower. Circle BMW will donate up to $10,000 and has set a goal to sell a minimum of 100 cars during October. The first two floors of the 10-story HOPE Tower are dedicated to cancer care, offering patients the latest in technology and treatment options, including: subspecialist physician offices, infusion, radiation therapy, genetic testing, counseling and supportive care. And, as part of the most comprehensive health care network in New Jersey, patients have access to a clinical research portfolio comprised of precision medicine, translational medicine, immunotherapy, cell therapy and vaccine development. Circle BMW, owned and operated by Tom DeFelice since 1981, is dedicated to excellence in all phases of the BMW ownership experience: sales, service, parts, accessories, lifestyle products and lifetime customer support. Serving customers in Central New Jersey, Circle BMW is one of the tri-state area’s leading luxury automotive dealerships and a four-time recipient of the prestigious BMW Center of Excellence Award for achieving outstanding levels of performance and customer service. In addition to new vehicles, Circle BMW offers Certified Pre-Owned vehicles that meet demanding standards for resale. Our award-winning Service Department is among the top in the nation and is proud to employ the largest staff of BMW Master Technicians in New Jersey. Circle BMW is one of the largest BMW authorized stocking dealers of original equipment parts and accessories in the region. Learn more at circlebmw.com and connect with us on Facebook.com/CircleBMW, Twitter.com/circlebmwsales, Instagram/CircleBMW and YouTube.com/circlebmwtv.